A thousand years from now, our epoch will be remembered as the time when we first left the Earth and saw it from beyond the outermost planet as a pale blue dot, almost lost against the backdrop of the stars. As we complete the preliminary reconnaissance of our Solar System, we hunger for a long-term vision of the human future. Now, the astronomer who brought the Universe to so many people answers that call - suggesting that our very survival depends on the exploration and settlement of other worlds. Pale Blue Dot reveals how science has revolutionized our understanding of where we stand and who we are and challenges us to weigh what we will do with that knowledge. 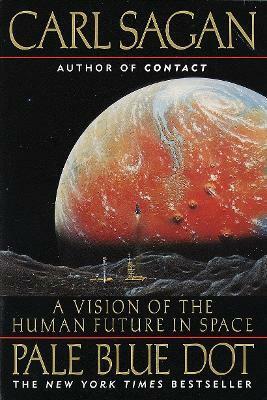 Emerging out of our sometimes reluctant recognition of our true place in the Cosmos comes a vision of an exhilarating future with a surprisingly spiritual impact. Carl Sagan served as the David Duncan Professor of Astronomy and Space Sciences and Director of the Laboratory for Planetary Studies at Cornell University. He played a leading role in the Mariner, Viking, Voyager, and Galileo spacecraft expeditions, for which he received the NASA Medals for Exceptional Scientific Achievement and (twice) for Distinguished Public Service. His Emmy- and Peabody-winning television series, Cosmos, became the most widely watched series in the history of American public television. The accompanying book, also called Cosmos, is one of the bestselling science books ever published in the English language. Dr. Sagan received the Pulitzer Prize, the Oersted Medal, and many other awards--including twenty honorary degrees from American colleges and universities--for his contributions to science, literature, education, and the preservation of the environment. In their posthumous award to Dr. Sagan of their highest honor, the National Science Foundation declared that his "research transformed planetary science . . . his gifts to mankind were infinite." Dr. Sagan died on December 20, 1996.